The 2011 Seminole County Fallen Heroes Memorial Ride began and ended at the Memorial Park at the newly opened Seminole County Law Enforcement Center in Wewoka, Oklahoma. 2011 was a record-breaking drought year in Oklahoma so no one complained when the event was momentarily interrupted by a shower. Due to a slight miscommunication, the riders arrived at a scheduled stop to find out that no food was waiting. Sheriff Shannon Smith and Becky Smith cut their ride short to rush back to Wewoka and, with the help of volunteers and local businesses, hastily prepared enough to feed everyone. Even with the small glitches, this was a memorable occasion. The new Memorial Park was formally dedicated in honor of every officer who had been killed while serving with the Seminole County Sheriff's Department. 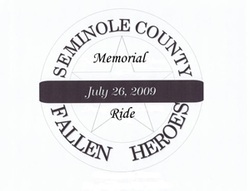 The Fallen Heroes Memorial Park was made possible by the proceeds of the 2009 and 2010 Seminole County Fallen Heroes Memorial Ride and by the generous donations of sponsors.